From New York Times bestselling author Catherine Ryan Hyde comes a hauntingly emotional novel of how one man’s life changes forever when he rediscovers his ability to feel the pain of others. Something has been asleep in forty-year-old cattle rancher Aiden Delacorte for a long time. It all comes back in a rush during a hunting trip, when he’s suddenly attuned to the animals around him, feeling their pain and fear as if it were his own. But the newfound sensitivity of Aiden’s “wake up” has its price. He can no longer sleepwalk through life, holding everyone at arm’s length. As he struggles to cope with a trait he’s buried since childhood, Aiden falls in love with Gwen, a single mother whose young son bears a burden of his own. Sullen and broken from his experiences with an abusive father, Milo has turned to acting out in violent and rebellious ways. Aiden can feel the boy’s pain, as well as that of his victims. Now he and Milo must sift through their pasts to find empathy with the innocent as well as the guilty, to come to terms with their deepest fears, and to finally discover the compassionate heart of a family. I would like to thank Lake Union Publishing and NetGalley for a copy of this novel. Slated to release this December, Catherine Ryan Hyde’s upcoming novel will pull you into a world of horses, cattle and people. Filled with heavy emotions, this story is as different from her others as it can be. Having red and reviewed Allie and Bea earlier this year, I am impressed at the diversity in the plots and the way the author writes. It is a pleasure to read her stories and there is always something to learn out of them. 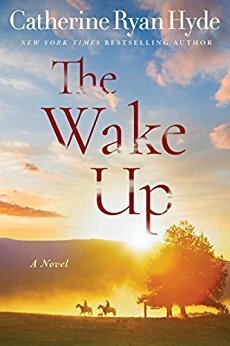 The story revolves around Aiden, a man in his forties, who experiences something he refers to as “The Wake-up”, the title of this story. All of sudden he is able to feel the emotions – fear, happiness, sadness, desperation, etc of animals around him. Being a cattle rancher, there is a lot to deal with and the decision to stop scares not only Aiden, but people around him who have known him for a very long time. This concept is a lot to take in and deal with. As the story progresses, Aiden is left alone by his neighbours and girlfriend, mostly due to his sudden change in behaviour which nobody understands or wants to. During this time, he meets Gwen, a single mother and her two children Elizabeth and Milo. Gwen is like a ray of sunshine in Aidden’s life, giving him the hope that he will be alright. Elizabeth is mature for her age and a very understanding child, the perfect child that every parent would want. Milo on the other hand has been a victim of abuse at the hands of his father and acts out in a lot of harmful ways, especially towards animals. It is difficult to talk to him, to understand him and he doesn’t get along with Aiden. Here starts the story, the journey of healing and acceptance. As Aiden starts to seek help, his therapy sessions bring out a lot about his childhood and helps the reader understand who he is and how he came to be this way, including how his own step-father took a chance on him. This inspires him to try to help Milo, to earn his trust and to show him that he is worthy of love no matter what he has gone through. The story also shows us how if you place your trust in a person and show them that they can achieve things in their life, it will change them. The story comes full circle with a horse birthing, that being the moment which changed young Aiden’s life and later something that helps Milo. As the truth unfolds, it is shocking to discover the abuse Milo has dealt with as well as the kind of dysfunctional family Aiden lived in until his step-father came into his life and helped him.